Definition - What does Eagle Pose mean? Eagle pose is a standing pose in which the yogi twists one arm with the other and one leg with the other. 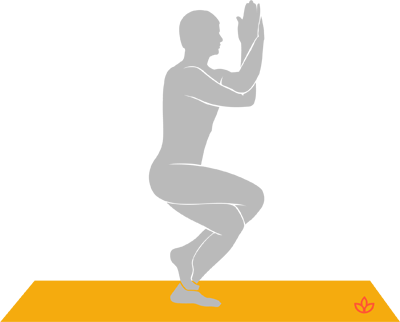 Begin in mountain pose then cross the left thigh over the right thigh and hook the left foot behind the right calf, knees bent. The right elbow is then placed into the crook of the left elbow as the palms of both hands come together. Repeat on the other side. The Sanskrit name for eagle pose is garudasana. In Hindu mythology, Garuda is the king of birds, who is a vehicle for Lord Vishnu. The term evokes the regal, bird-like stature of the pose.